On Wednesday, April 17, the Niedersachsenhalle in Verden will be the stage for Hannover's promising jumping talents. 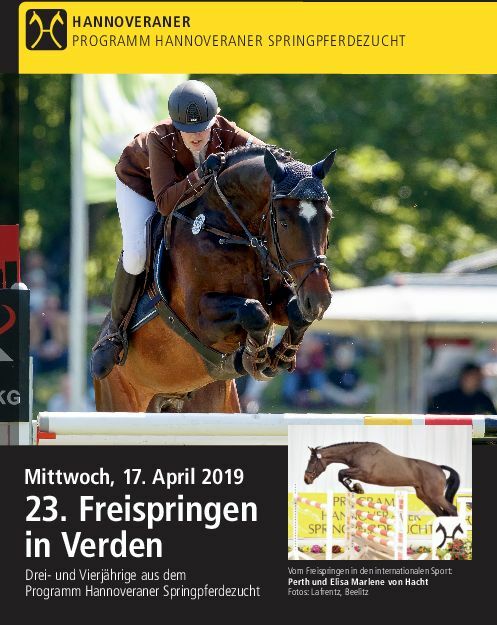 Starting at 10 am Philipp Weishaupt and Jörg Münzner will judge and comment on the three and four year olds from the Hanoverian Jumper Breeding Program at the free jumping competition. After the competition, the two internationally successful show jumpers and trainers will have a panel discussion about which criteria are important in show jumping breeding today. This is the 23rd edition of the free jumping competition, which took place for the first time in 1997. Numerous careers began in the Niedersachsenhalle. For example, Derby winner Professional Aircare had his first public appearance in Verden at the young age of four. On April 17, around 40 three-year-olds and 20 four-year-olds are expected to compete for the winning sashes in their age groups. The condition for participation is that dam and sire are registered in the Hanoverian Jumper Breeding Program – a guarantee for first-class performance paired with highly interesting pedigrees. In the free jumping competition, not only scope and ability but also type and overall impression are judged. The horses are individually commented by the judges. They are proven experts. Philipp Weishaupt, who belongs to Ludger Beerbaum's team, has achieved numerous successes with his Hannoveraner horses Souvenir, Solitaer and Call Me Eva. Jörg Münzner rode with Graf George to team silver at the Olympic Games in Barcelona. He is now the national coach in Hannover and is a member of the licensing commission of the Hannoveraner Verband. The free jumping competition starts at 10 am. Admission is free. The entry result will be published on the internet at www.hannoveraner.com. Catalogues will be available on the day of the event.